SCOTLAND’S favourite fictional detective is back – and taking a bitter sideswipe at the capital’s notorious tram system. The latest installment of Ian Rankin’s best-selling “tartan noir” series is due to hit shelves tomorrow with Inspector John Rebus leaving retirement for one last case. In the 28 years since the first Rebus novel was published, the books have become a worldwide publishing sensation with more than ten million copies sold in 26 language translations. 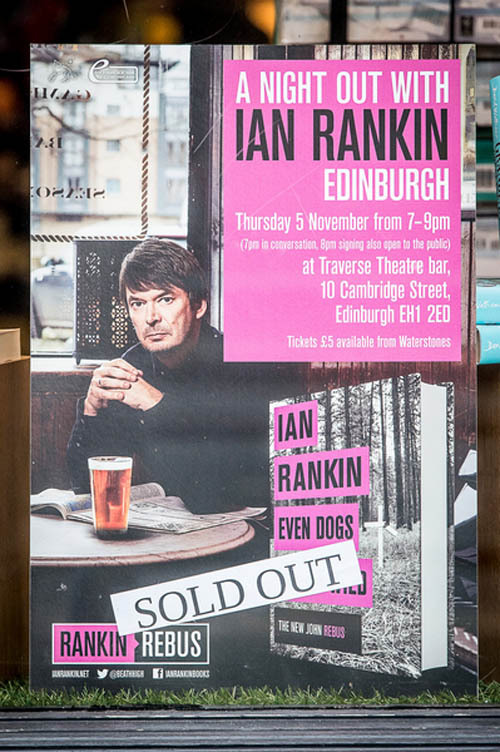 A poster in Waterstone’s, Princes Street, Edinburgh, where thousands of Rankin fans are set to snap up their copies of the new Rebus novel. Fans have eagerly anticipated the latest outing for two years – but may be surprised that in the newest dark tale of murder and betrayal the Edinburgh tram system also gets a not-so-honourable mention. Rankin writes: “As he crossed the Forth Road Bridge, he saw its replacement taking shape over to the west. One character mocks the Vauxhall Insignia cars used by the force, saying “this thing couldn’t outrun a segway”. Rankin’s new novel even features a female police officer with the appearance of Nicola Sturgeon. Throughout the novel her integrity is called into question – with dark secrets emerging about her character as the action escalates. “Even Dogs in the Wild” – the 20th in Rankin’s series of Rebus novels – has already received rave reviews from critics. The novel sees Rebus unhappy in his retired life – and eager to offer his help to old ally DI Siobhan Clarke help when she calls for him. The plot follows an investigation into the death of a senior lawyer and a deadly threat made against Big Ger Cafferty – Rebus’ longtime nemesis. Meanwhile DI Malcolm Fox – another Rankin creation – works with a covert team to investigate a violent Glasgow crime family. Edinburgh’s tram system was widely criticised after it came in millions of pounds over budget and years late. To this day critics claim that the hugely expensive trams remain largely unused by most of the city’s population – including the fictional Inspector Rebus.